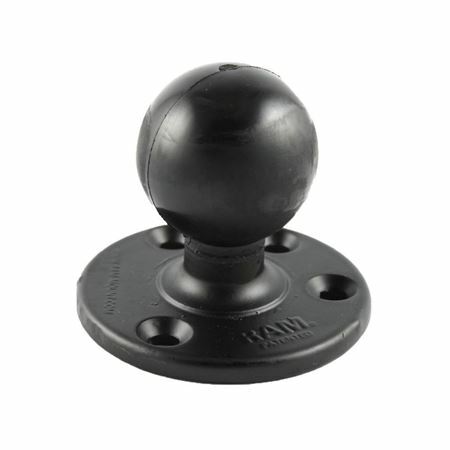 The RAM-D-202U 3.68" Diameter Base with 2.25" Ball features a 2.25" rubber ball attached to a 3.68" diameter round base with pre-drilled holes. The RAM 3.68" Diameter Base w/ 2.25" Ball from the RAM Mount Bases range is professionally powder coated with marine grade aluminum. The device is made of a 3.68” diameter circular base that is joined to a 2.25” diameter rubber ball. Built with pre-drilled holes, the device comes with three holes at 120 degrees and another pair of holes at 180 degrees.